Today we take for granted relatively fast shipping from around the world without considering not only the journey of the item itself, but also the story of the infrastructure required to facilitate that fast delivery. 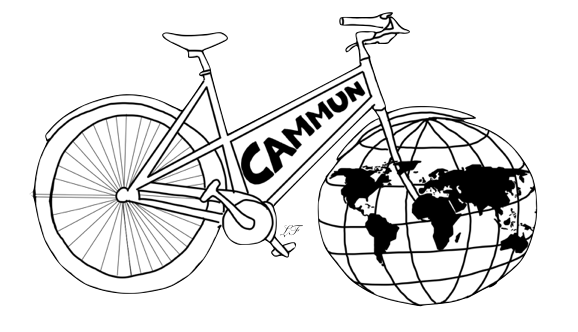 The world has been shaped by canals, quite literally! Numerous canals have been built to facilitate more efficient trading routes, from the extensive canal networks of Britain that facilitated the industrial revolution of the UK, to more recent, large scale projects such as the Panama Canal through Central America, and Suez Canal through Egypt. These canals, although allowing a much shorter and cheaper route, still act as a bottlenecks, for example the Panama Canal allows an average of just under 40 ships through a day, and the Suez Canal an average of around 47 ships a day. 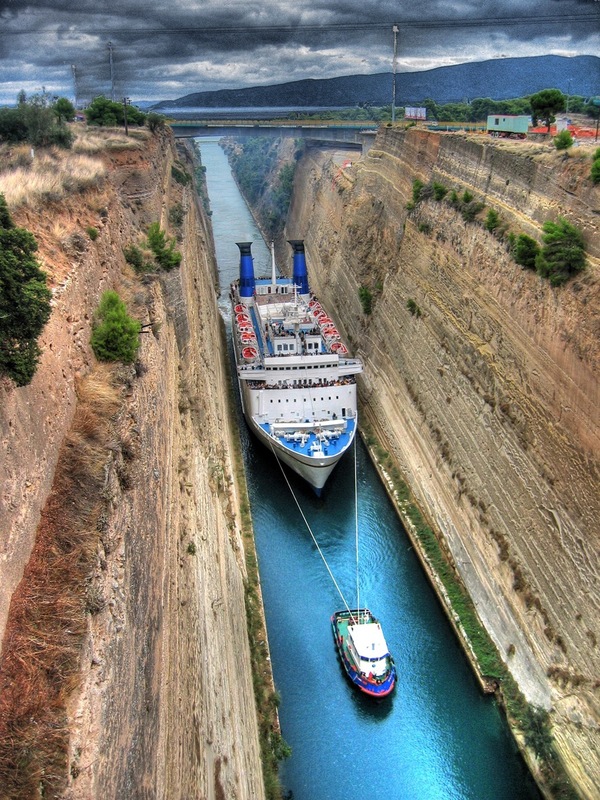 Furthermore there are size limitations of the ships able to pass through. For example the maximum load of a ship that could pass through the Panama Canal up until June 2016 was 8,000 TEU (Twenty-foot equivalent unit. I.e. It could carry up to 8,000 twenty foot long shipping containers). This is referred to as the Panamax. The Panama Canal underwent an expansion with a third lane able to carry New Panamax vessels with a capacity of 12,500 TEU. For a little perspective… a single twenty foot container can hold 8,000 trainers! Meanwhile the Suezmax is between 10,000 and 15,000 TEU. The capacities are, to an extent, variable as maximum ship size is also dependent on width, depth at different weights, dead weight tonnage (all the weight carried that isn’t the ship itself), and if the Canal has locks there will also be a maximum length. This is part of the reason the the Suez Canal can accommodate larger ships; it doesn’t have any locks so the length of the ship isn’t limited. However, despite costly expansions to accommodate larger ships, the canals will never be able to keep up with the ever increasing size of container ships and oil tankers. 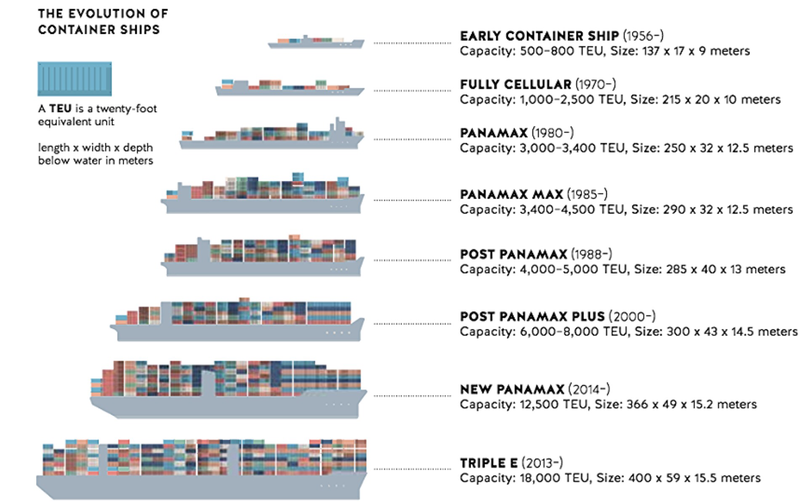 This is because the larger the ship, the greater the efficiency, and the cheaper it is to transport a unit mass of cargo. Furthermore, although the Panama and Suez Canal both dramatically reduce shipping routes, there are still a number of inconveniently long sections of trading routes due to natural land barriers, and bottlenecks due to narrow straits. These straits also have limits to the size of ships that can pass through. To encourage greater efficiency of shipping routes, and encouraging trade between newly connected countries, a number of new “mega-canal” projects have been proposed. The most well known is probably the Nicaraguan Canal, which would accommodate larger ships than the Panama Canal, and reduce the bottleneck there, while bringing massive economic development to Nicaragua. Other proposed canals include the Thai Kra Canal, removing the need to circumnavigate the Malay Peninsula in order to travel between the Indian Ocean and South China Sea, instead cutting across Thailand’s section of the peninsula. This also removes the size limits and bottleneck effect of the Straits of Malacca. Perhaps surprising is that the Nicaraguan canal project is not funded by the Nicaraguan government, or even a foreign government, but a private company: the Hong Kong Nicaragua Canal Development Investment Company (HKND), with Wang Jing the chairman and CEO. The rights signed over to the HKND by the Nicaraguan government are certainly impressive: the “right to possess, occupy, use, or perform any activities upon all government owned and privately owned real property which may be reasonably necessary or desirable” for the canal. The fate of the HKND and Wang Jing are now interlinked with a country the other side of the globe, worrying considering that Wang Jing lost 85% of his net worth during China’s financial crisis, falling from $6.9 billion in March 2015 to $1.2 billion in March 2017. Some see this as strong evidence that the building of the canal will not go ahead. Many countries around the world are likely to benefit from the presence of a Canal allowing faster shipping and more boats to pass between the Atlantic and Pacific Ocean, so political disagreement is fairly low. The economic gain for Nicaragua itself would likely be huge, much needed as the country is the poorest in Central America and the second poorest in the Western Hemisphere. The Nicaraguan government claims the canal would boost annual economic growth from 4.5 percent in 2013 to 14.6 percent in 2016. Citizens will likely look at the success of Panama who thanks to its canal is one of the fastest growing economies of the world, and has even been referred to as the “Singapore of Latin America”. Ecologists, however, are understandably horrified. The Environmental and Ecological effects of such massive proposed projects are of course going to be extreme. 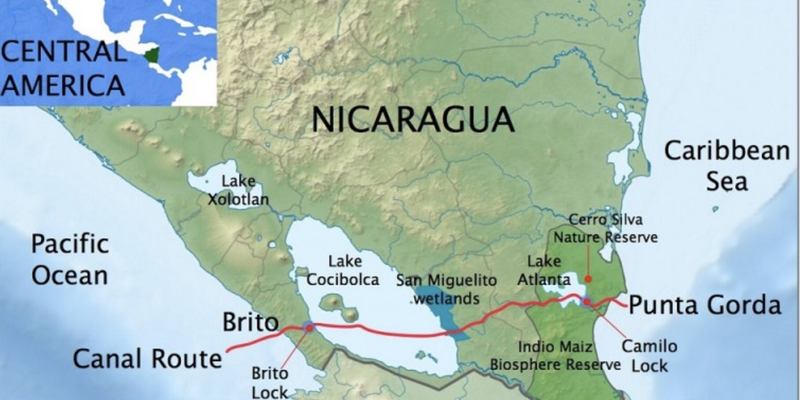 In the case of the Nicaraguan Canal, the Canal is proposed to cut through Lake Nicaragua / Cocibolca which is the key freshwater reservoir for Central America, currently used for irrigation, drinking, and power production, but if dredged will be unable to be used for irrigation or drinking. It is also the biggest tropical freshwater lake in both North and South America, containing at least 16 species of cichlids, a couple of species of sawfish, and even Carcharhinus leucas, the Caribbean bull shark. However introducing a Canal would allow the introduction of species from both the Pacific and Atlantic oceans, with invasive species and plants threatening the native species of the region. Furthermore the dredging process disperses sediment, increasing the turbidity of the water, reducing the amount of light that can reach aquatic plants and other photosynthetic organisms, and thus reducing the oxygen content of the water, killing many marine life forms such as fish, potentially disturbing the ecosystem of not only the lake, but also affecting animals in some way reliant on the lake. Then, there is the ever present risk of accidental spillages from ships. Along the rest of the length of the Canal, the Canal would cause degradation of surrounding habitats and ecosystems, in part due to the environmental fragmentation caused by the physical barrier for wildlife trying to cross, reducing species and genetic diversity, and thus ecological robustness both sides of the Canal. Construction would also require the forced relocation of up to 100,000 people, including numerous indigenous tribes, with 52% of the canal passing through indigenous territories. An important thing to remember when discussing Canal projects is that we do not live on a static world. That seems obvious, but the climate and thus many geographical features are forecast to change in a multitude of ways. For example an average increase in sea temperatures will cause sea levels to rise due to the melting of ice caps and the fluid properties of water: fluids expand when heated. This means that there is a possibility that, if global temperatures continue to increase, certain shipping routes currently too shallow for large ships could arise into existence, removing the need for building canals. Furthermore, the melting of the north polar ice cap would allow polar shipping routes to come into use. Although the environmental impacts of building canals are huge, the net effect on the climate is debatable. By encouraging ships to use shorter routes they reduce fuel use, and large canals allow the more efficient large ships to be used, again reducing fuel use per unit mass. Furthermore, the economic development of the country through which the canal passes could cause a movement from dirtier, cheaper fuels such as kerosene, to cleaner forms of electricity, however it could also increase demand for energy. So, do we prioritise ecological and environmental health over economic gain? Are the two mutually exclusive? Just as ecological networks are fantastically complex and at times surprising; the environment, human activities, and indeed massive infrastructure projects can interact with each other in dynamic and perhaps unpredictable ways. Whether you see the introduction of new canals is largely based on what perspective you are coming from: short, medium or long term economic, national or global, environmental or humanitarian… the list goes on. How to decide on a perspective? Whatever floats your boat. (Pun Intended).